The two top Senate appropriators said they are aiming to complete a broad spending and border security deal Monday night after reviving stalled negotiations. 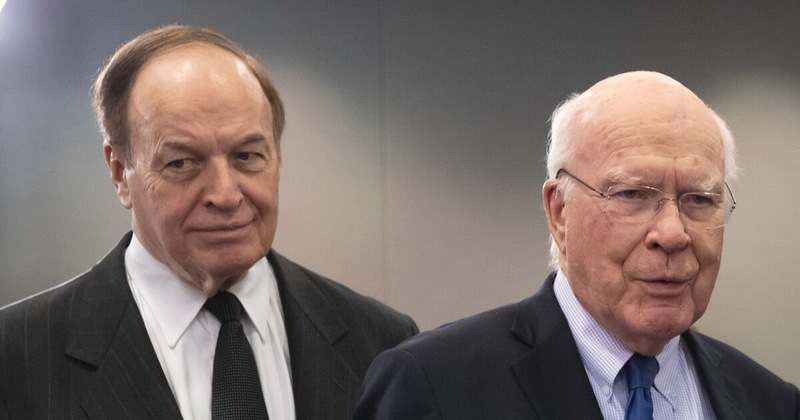 Senate Appropriations Committee Chairman Richard Shelby, R-Ala., and the panel’s top Democrat, Patrick Leahy, D-Vt., said the group of four bipartisan negotiators from the House and Senate will convene at 8 p.m. for the third time today for “serious” negotiations. T-minus four days until the government could shut down again over Trump’s hateful wall and deportation agenda. Today, Indivisibles across the country hosted events to tell their members of Congress (MoCs): stop playing games with our lives (check out one of our favorite moments so far here). But we’re not done just yet. This week, it’s critical that you keep up the pressure, both in-person and on the phones, and tell Congress no additional money for Trump’s wall, ICE agents, or detention beds. Post-shutdown negotiations on the border wall have stalled. In return for ending the longest shutdown in history (that cost the economy $11 billion), Democrats and Republicans agreed to convene a joint “conference committee” to negotiate an agreement on Department of Homeland Security (DHS) funding, including the border wall. According to news reports and our intel from Capitol Hill, those talks have stalled -- and Trump’s temper tantrum over funding for his wall and other hateful immigration policies continues. If negotiators fail to reach a deal, the government will shut down again at midnight this Friday. Let’s be clear: this fight isn’t just about the border wall; it’s about rejecting Trump’s white nationalist, anti-immigrant agenda. House Democrats must stay strong and reject any more money that would allow Trump to tear more families apart. As we approach that deadline, there are three critical pieces of negotiations to watch closely and to pressure your MoCs on: no beds, no boots, no wall. No beds. Congress has set a limit of 40,500 detention beds, and yet ICE continues to dramatically increase the average daily population of detainees. This is because ICE is able to freely transfer money from other accounts to increase the number of individuals and families they jail. You may remember that last year, Senator Jeff Merkley (D-OR) shone a light on the practice, revealing that the Trump administration diverted nearly $10 million from FEMA to ICE for detention beds. Without limits to ICE’s transfer authority, they’ll continue to jail tens of thousands of immigrants and families. No boots. We're hearing that negotiators are going to give Trump more Homeland Security Investigation (HSI) agents. Don't be fooled. HSI agents are ICE agents -- and funding for HSI agents is funding for Trump’s anti-immigrant agenda. In fact, HSI is responsible for many high-profile, highly militarized worksite raids. The National Immigration Law Center has a great resource with more information on HSI agents here. Congress shouldn’t increase HSI’s funding -- it should cut it and prohibit HSI from arresting workers while conducting this type of enforcement. No wall. The latest intel is that negotiators are discussing anywhere between $1.3 to 2 billion for wall money. Make no mistake, this money will devastate local communities so that Trump can fulfill his hateful campaign promise to build a wall along the southern border. It’s critical to keep up the pressure on your MoCs and tell them not one more dollar for Trump’s hateful wall. Oversight hearings on Trump’s inhumane family separation policy continue. If you’re anything like us, you’ve watched Progressive Caucus Co-Chair and friend of Indivisible Rep. Pramila Jayapal’s (D-WA) amazing grilling of Acting Attorney General Matthew Whitaker on the Trump administrations vicious family separation policy. This week there will be two oversight hearings into the horrific family separation policy, one in the House Judiciary Committee and another in the House Oversight Committee. The House could make (good) history this week and reject the war in Yemen. The House is set to aggressively assert its constitutional powers and pass a resolution ordering Trump to end the unauthorized and immoral US support for the Saudi-backed Yemen war. Here’s what you need to know about why this is such a big deal. Hearings on the For the People Act (H.R. 1) wrap up in the House. Has your Representative co-sponsored H.R. 1 yet?This week, the Homeland Security Committee will hear testimony on election security, and the House Administration Committee will examine expert testimony on the many intersectional reforms included in this bill. This takes us closer to getting the bill on the floor of the House, which is expected to happen in early March. Tell your MoCs: no boots, no beds, no wall and push for a clean, year-long CR. Your MoCs need to hear from you this week before the government could partially shut down again this Friday. Use our updated call script here. Prepare now if Trump declares a national emergency over the wall. Trump continues to threaten to declare a fake emergency to get his way on the border wall, making a mockery of real national security emergencies and taking us another step toward authoritarianism. Read up on the three things Congress can and should do if it happens. Tell your MoC to cosponsor H.R. 1. Check here to see if your Dem MoC has co-sponsored H.R. 1. If they haven’t, use our call script to ask that they support this critical pro-democracy reform legislation. Start planning for February recess. While the looming partial shutdown could change Congress’ plans for February recess, check to see if your MoCs are holding an event and starting planning to ask the hard questions. Find town halls near you on our map here. Our March National Activist call is already in the works! Sign up here to make sure you don’t miss the latest Indivisible updates.